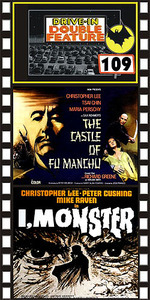 CASTLE OF FU MANCHU (1972) Christopher Lee, Maria Perschy, Richard Greene. Fu Manchu has a super weapon that can freeze oceans—and ships. He plans to blackmail the world; his first big target is the Black Sea. Will Nayland Smith foil him? Cool lab scenes. Chin, Lee’s daughter, is a REAL viper! Watch for the scene when she wacks off the governor’s head. Color, 35mm. Plus: I, MONSTER (1971) Christopher Lee, Peter Cushing, Mike Raven. In a reworking of Dr. Jekyll and Mr. Hyde, Lee plays a doctor who creates a formula to bring out man’s evil. Color, 16mm.